I am a kimono consultant, an expert in wearing the traditional Japanese kimono. I love kimono, and personally wear them often. Sometimes, I welcome foreigners into my home, and teach them the proper way to wear a kimono. I will provide a yukata for you, and you can learn how to wear it in my home. Come along, then show off your new yukata to your family and friends! 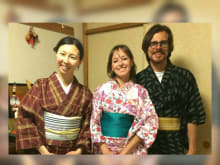 Try a Kimono Lesson - Take Home a Free Yukata as a Souvenir! Mari-san gave me a very warm welcome into her house. She was so generous and she even let me enter the kotatsu when I was there. The lesson itself was great! It was taught in great detail and Mari-san was a great teacher. I had loads of fun and I learnt a lot as well. Why not spend a day with a lovly family, instead of a boring Hotel/Hostel? Mari was such a great host. She made some Okonomiyaki for dinner, which was super delicious. Also we went to a public bath house. For me it was the first time in a real public bath and i loved it. We had a lot of talks about music and culture. I really recommend this Home stay experience. Don't miss out on it if you are in Osaka. Mari is an incredible host! I was looking forward to meeting Mari and her family as part of my Japan trip and I had such a great time it was far better then anything I expected. Mari is a really nice person and has done alot of travel herself. I knew Japan was going to be very different to Australia so I wanted to be open to new experiences and definitely wasn't disappointed. Nattō for breakfast :) - I think everyone got enjoyment out of me eating Nattō! Mari also helped me overcome my shyness to Public Baths/Onsen - as I had intended to visit one but hadn't yet - I now know why they are so popular and possibly addictive! Thankyou very much for sharing your home and introducing your family - I had a very memorable & fun time!! 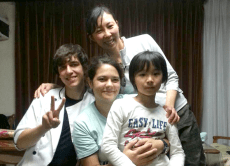 Mari was very hospitable to us and a very good teacher. 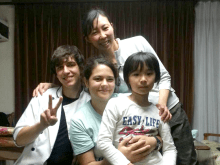 Would recommend her kimono/yukata lesson to other travellers.